As I reviewed the photos and scanned digital images in my personal collection to find something to reflect the love of mothers towards their children for footnoteMaven's new carnival, I Smile for the Camera, I realized it was not an easy task! Most of the photos in my collection either show complete families, or babies by themselves. Here were a couple I thought worth sharing. The first is of the sisters of my Great-grandfather William VALK. 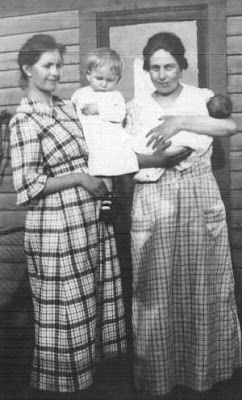 Older sister Jennie James (VALK) HEIDEMA is shown on the left with her second-born, Gerritt John HEIDEMA, Jr., about two years old (firstborn child John James HEIDEMA died as an infant). On the right is younger sister Geertje "Gertrude" James (VALK) YSSELDYKE with firstborn child Jacob YSSELDYKE, Jr. Pride and joy are reflected in these mothers' eyes. At a time when infant mortality was still quite high, children (and mothers) who survived childbirth and infancy were fortunate. Source: Sisters Jennie Valk Heidema and Gertrude Valk Ysseldyke with their sons Gerrit Heidema and Jacob Ysseldyke. Photocopy of photograph taken 1921. Original in the possession of John Heidema, Little Silver, New Jersey. 2000. Mother love doesn't end when a child becomes an adult. 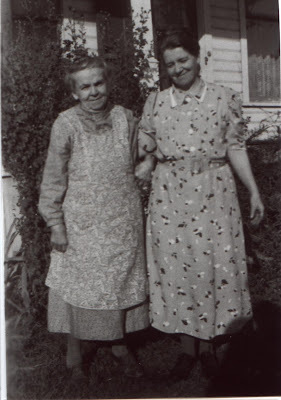 Here we see my 2nd-great-grandmother, Mary Lucy (STRONG) WRIGHT with her daughter, Ethel Melissa (STRONG) HASTIE. Their love for each other is so evident in their postures and expressions. Ethel and her husband cared for Mary in the Pacific Northwest in her elder years after she was widowed. 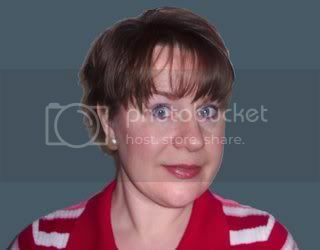 Source: Strong, Mary Wright and daughter Melissa Strong Hastie. Reprint of photograph taken c. early 1940s. Original photograph in the possession of Avis Strong Russell, Italy, Texas. 2008. Written for the 1st I Smile for the Camera Carnival, "Love of Mother/A Mother's Love". What great photographs! When I saw these, I was suddenly reminded of the full apron that my grandmother wore pretty much all of the time except when going to church. I met Aunt Ethel when she was very elderly (1979), and if I'm not mistaken, she was wearing an apron even then!